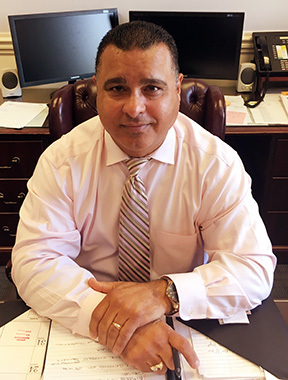 Trenton Interim Police Director Pedro Medina. WEST WINDSOR – Mercer County Community College (MCCC) and the County of Mercer invite the community to attend a 17th anniversary ceremony in remembrance of September 11, 2001. The event is set for Tuesday, Sept. 11, 11 a.m., at MCCC’s West Windsor Campus, 1200 Old Trenton Road, adjacent to the Student Center and the Quad. In the event of rain, the ceremony will be held in the Student Center. Guest speaker is Trenton Interim Police Director Pedro Medina. Medina, an alumnus of Trenton Central High School, MCCC, and Trenton State College (now The College of New Jersey), has served as a law enforcement officer for more than three decades. Medina began his career in 1982 as a patrol officer in the Trenton Police Department (TPD), and went on to serve as a detective in the department’s Criminal Investigation Bureau. In 2004, he was promoted to Detective Sergeant and served as TPD’s public information officer until his retirement in 2010. Medina returned to public service in 2011 as undersheriff for the Mercer County Sheriff’s Department, and was named Trenton Interim Police Director in July. Medina has also served the community as a member of the Trenton School Board, including two terms as president, and as a member of the MCCC Board of Trustees. Additional speakers for the Remembrance Ceremony include Mercer County Executive Brian M. Hughes, MCCC Board of Trustees Vice Chair Vice Kevin Drennen, and MCCC President Jianping Wang. The invocation will be given by the Rev. Robert Wittik, MCCC chaplain. Musical selections will be performed by MCCC faculty and students.